Specific Weight Reduction FRW Wet Food Trays for Adult Cats are complete meals that can be used as an ideal part of a weight loss programme for adult cats that need to lose weight. High in fibre and protein, yet still low in fat and calories, the diet has been designed to satisfy your cat’s appetite and leave them feeling full. This means your cat can be fed a large amount of tasty food, whilst till helping them to lose weight. Specific Weight Reduction also contains additional L-Carnitine which helps move fatty acids into your cats’ cells to be burned for energy; meaning the weight loss comes from fat rather than lean body mass. 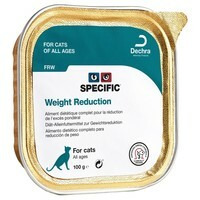 We have two cats who due to them being slightly overweight were put on this at the suggestion of the vet. Both seem to like it and we have seen that their weight has come down following the clear and simple instructions. It does need to be cut up as it is like a solid block inside the packet, the smell is moderate to strong compared to wet food pouches. The container is recyclable though in our case we use them on strings to keep the birds off the soft fruit on the allotment. My cat was recently diagnosed diabetic and she really likes this food, even though it doesnt really have a scent and looks / tastes very bland - yes, I did try a teeny bit! It is a good price compared to some of the other brands of diabetic prescription wet foods. I haven't yet tried her with the dried version.